I just want one nozzle, which one is the best? 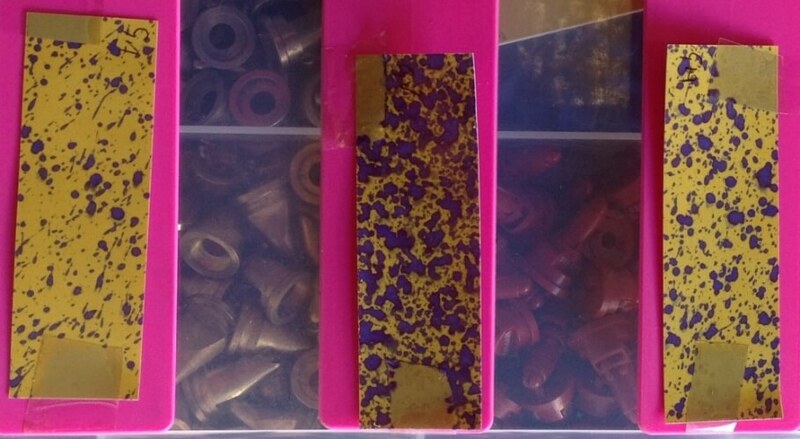 Using only one nozzle will compromise some aspect of a series of applications. 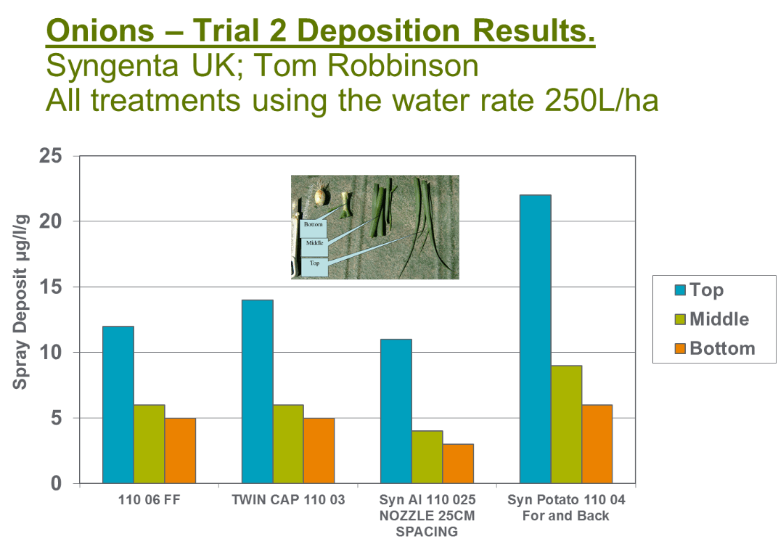 However, the Syngenta 110 025 air induction nozzle generally performs well. Manufactured by Hypro it creates more droplets per liter than other air induction nozzles of the same size. As long as the crop isn’t too large (e.g. later season), I recommend this nozzle with lower water volumes. This is because I tend to see more application issues arising from excessive water rates that wash product off the plant. Unless you are after soil borne diseases, avoid run-off and wastage by using the SAI 110 -25 with volumes of about 200 L/ha. The following graph shows the results of application volume on brussel sprout coverage (Syngenta UK). 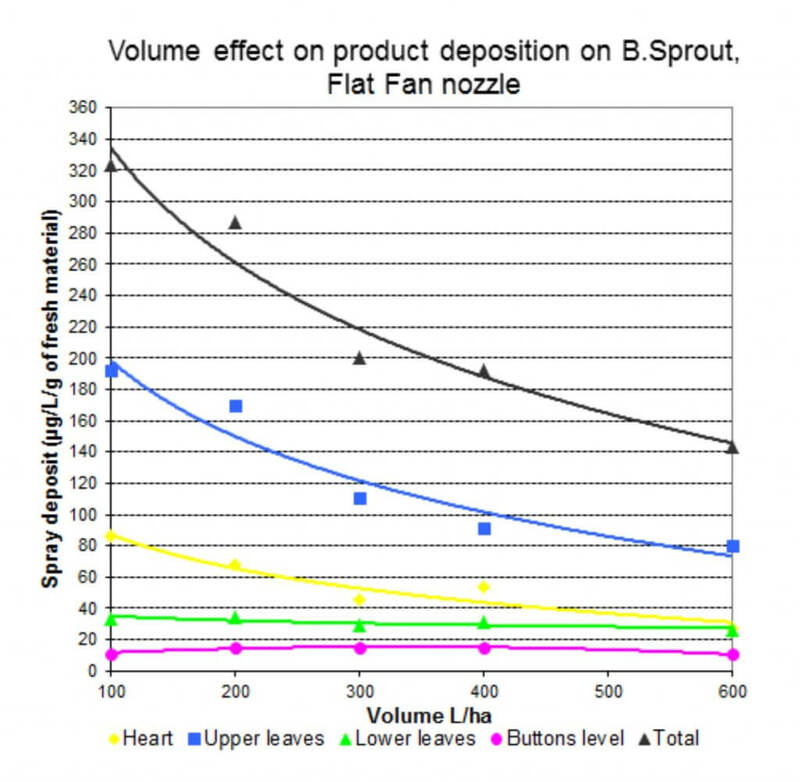 When I am trying to increase canopy penetration, I like the Syngenta Vegetable Nozzle (SV65-04 flat fan). 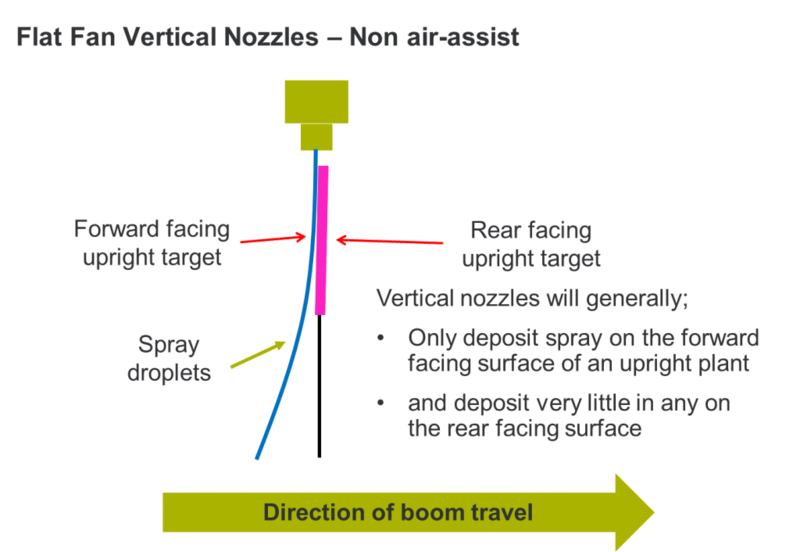 I feel the narrow spray fan angle delivers a directed spray pattern into the crop canopy which can significantly improve penetration. This is a good fit for late-season insecticide and fungicide sprays in brassica crops, where pests and diseases can be hidden deep in the crop canopy. I worked with a vegetable grower who was having trouble controlling sclerotinia in his mature fennel crop. The target was the base of the stem, deep in the canopy. 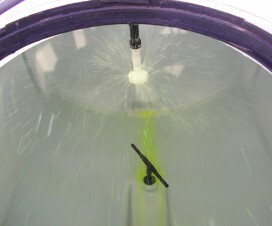 In the following image you can see the water sensitive paper taken from ground-level in the canopy. The nozzles used from left to right are; Hardi Twin AI 110-05, Syngenta 65-06 vegetable nozzle and Syngenta AI 110-05. 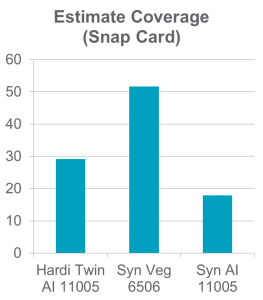 Coverage was estimated using the SnapCard app (freely available for iPhone and Android platforms). So, I know pyrethrum is a flower and not a vegetable crop (think Chrysanthemum), but it can be hard to penetrate, so it’s a good example. 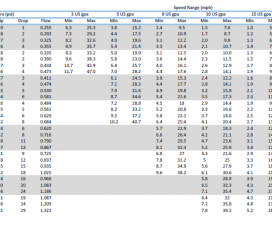 We compared five nozzles and estimated coverage using SnapCard. The Veg 65-04, AI 110-035, and Twin AI 110-04 seemed to improve coverage over the Defy 3D 85-04 and conventional AI 110-04. For broadacre farmers (i.e. field or cereal crops) the SV65 flat fan nozzle has also proven to be extremely successful at penetrating thick standing stubble residue when using pre-emergent herbicides. Likewise, it performs well when targeting lower leaves during fungicide applications. Again, I believe that this is due to the narrow fan angle of the spray giving a more direct spray down through both the stubble and the current season’s foliage. 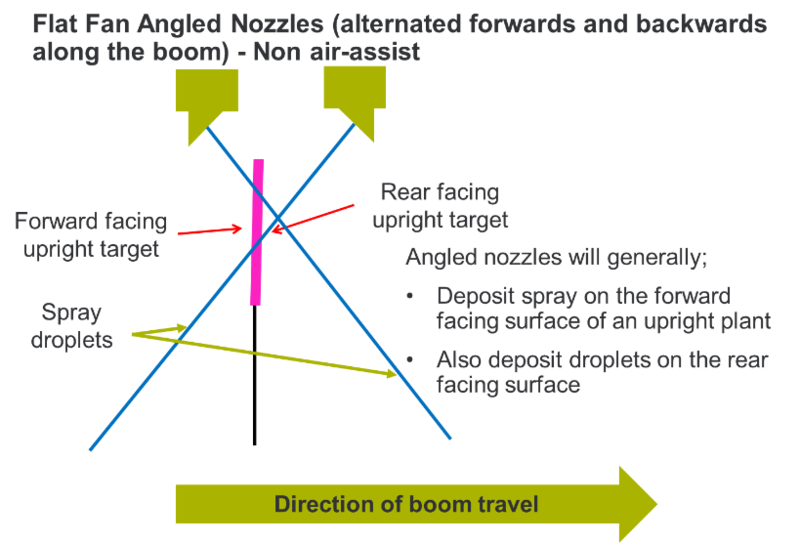 [Editor’s note: Be attentive to nozzle spacing and boom height when using narrow fan angles to ensure correct overlap and complete coverage]. For onions and broadleaf crops (e.g. potatoes and beans) I feel the nozzles that have their spray fans angled forwards and backwards along the boom are best suited (note: this does not work on air-assist booms). 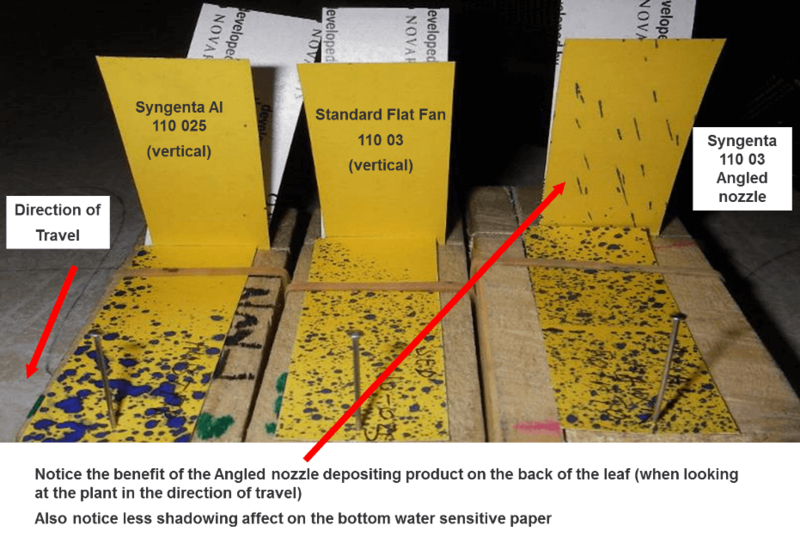 The following image shows coverage from angled sprays on simulated upright targets in the field using water sensitive paper. The Syngenta angled nozzles are designed with a 30° incline intended to improve foliar coverage down to the lower leaves on some vegetable crops. Although originally designed for use in potato crops, I have also had success in other vegetable crops such as onions and leeks. 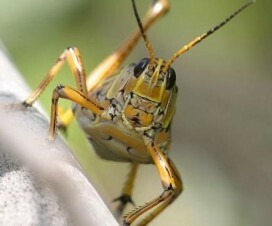 No matter the nozzle choice, or how good the application technique may be, the priority should be to manage disease and insect pests early in crop development. 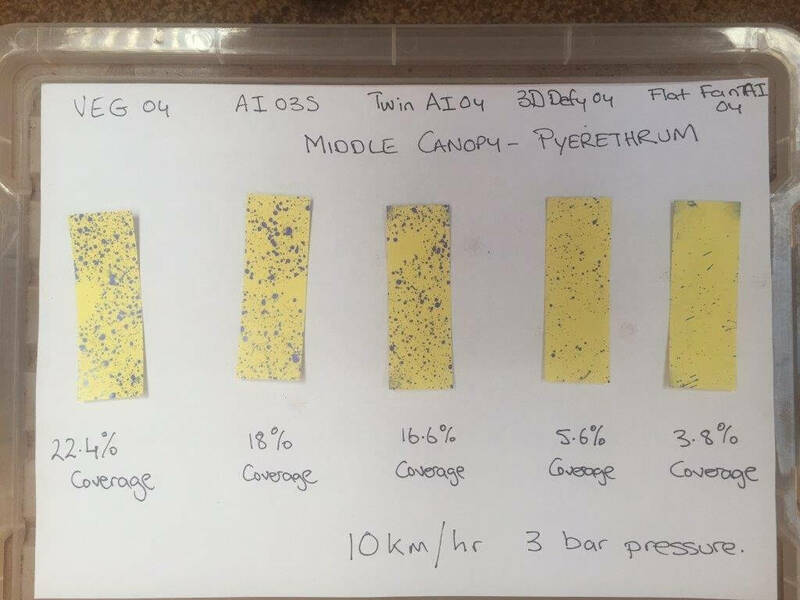 If you are trying to control heavy pressure from disease or insects and it’s deep within the crop canopy, often, you’re going to come off second best. Prevention is always better than cure, no matter what crop protection product you are spraying. With that caveat, I’ll leave you with my suggested nozzle choices. Preferably, I would suggest installing (at least) a triplet nozzle selector to quickly change between three nozzles for each crop. Large 200-400 65 ° Fan Angle Nozzle 65º fan the best for penetrating to crown. Onions Small 100 Syngenta 3D Nozzle 85 03, 85 035 and 85 04 cover both sides of the plant Coverage, run-off and missing the target are the problems likely in onions. Scott graduated from Roseworthy Ag College in 1994 with a Bachelor of Applied Science, Agriculture. 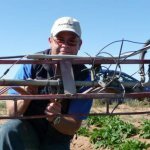 He spent a number of years as a horticultural and broadacre agronomist in the Riverland of S. Australia before joining Syngenta in 1997 as a Territory Sales Manager. In 2005 Scott took on the role of Solutions Development Lead, Horticulture with Syngenta Australia. Scott specializes in pest and disease management in horticultural and broadacre crops, application technology and resistance management strategies for fungicides, insecticides and herbicides.